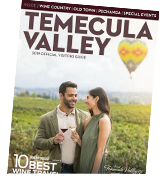 Take in the vibe of Old Town Temecula’s hip, energetic walking and foodie district or relax among the vines dining at one of the many alfresco restaurants offering fresh and creative cuisine and inspiring views. In Temecula Valley, seasonal menus have always shown a commitment to sustainable produce and seafood with an emphasis on sourcing locally. The inventive, fresh seasonal cuisine is deliciously big with flavor and variety whether you choose a white linen or bistro dining experience.